First, detach the white layer from the back of the napkin. Then spread a coat of Matte Mod Podge on the vase and tear the napkin into various sized pieces and lay gently on the glass -- make sure to carefully rub out any bubbles (the wet napkin will be delicate). Some wrinkles may occur but this is nice as it can give it a 'crinkled' look. After you have done the vase and bottle, let dry for 24 hours. 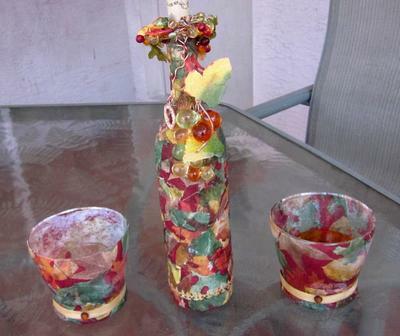 I then wrap a metal wire with glass gems to resemble grapes around the top of the wine bottle for a very nice effect. I also used gold ribbon to surround the bottom of the vases along with a gold bead. I love Bling! Finally, spray both vase and bottle with a clear gloss finishing spray that gives a protective hard finish. 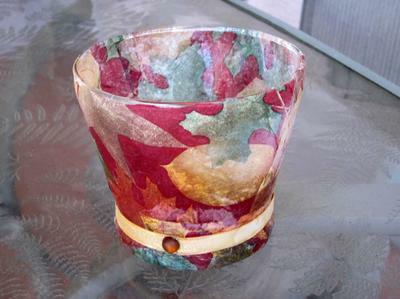 The end result is a very nice fall centerpiece and makes great gifts for friends, family, co-workers, etc. BTW, one can also use different colored or patterned tissue paper. This is so beautiful! 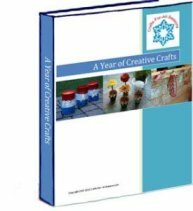 Thank you for sharing this craft!